I made three more of those BEST toiletry kits EVER. The one on the left is for our friend, Connor. It is almost identical to the one I made for Fritz. The one in the middle is for Billy. 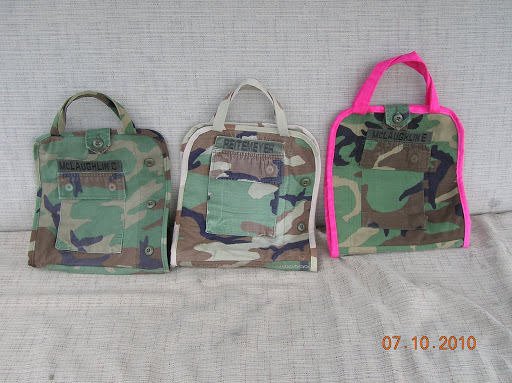 I used the tan fabric for the trim and handles so the boys could know at a glance which bag belonged to whom. The bag on the right is for our friend, Emma (Connor’s sister). I used a different closure for Connor’s bag than I did for Fritz’s. I like this closure better, but there wasn’t enough room on Billy’s kit to fit it. The uniforms I’m using are different styles and different sizes, so the pieces aren’t going to cut out consistently. It’s what makes each bag so unique. Emma picked out a hot pink flannel fabric. I did not buy this fabric; it was pulled from leftovers from other projects (I made bags for the girls’ to carry their ballet shoes using this flannel). Again, this entire project was zero cost, which suits me very well right now. 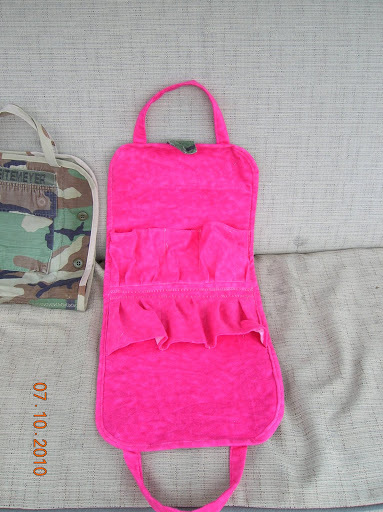 I think the hot pink looks fabulous with the green woodland camo pattern. 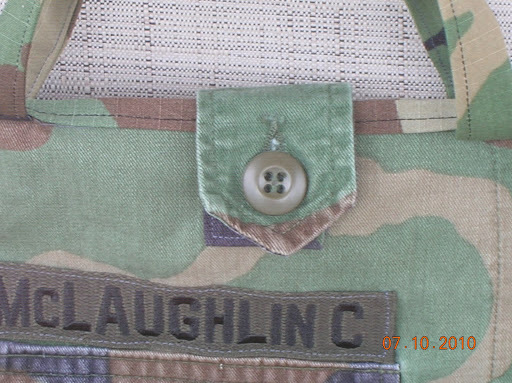 This entry was posted in sewing projects. Bookmark the permalink. Those are awesome! You are so creative and talented! Isn't she though! (Why they say necessity is the mother of invention – count on Michelle to come through brilliantly.) If I didn't already have the perfect one for travel, I'd ask her to make me one. Maybe she should add this to her stockings & slings. If I send you some old uniforms of Jim's, could you make me two? LOVE the pink version…but they are all fabulous. I'm posting a spotlight on your creations tomorrow. Well done.